Have you ever heard of Tuba Christmas? This benefit concert, which raises funds for the cancer league of Baselland and Baselstadt, is held on Sunday 21st December 2014 in the city center of Basel. Our Sousaphonist Harry Steiner from the Brass Band Black Box Music Reinach will again be part of this good cause. 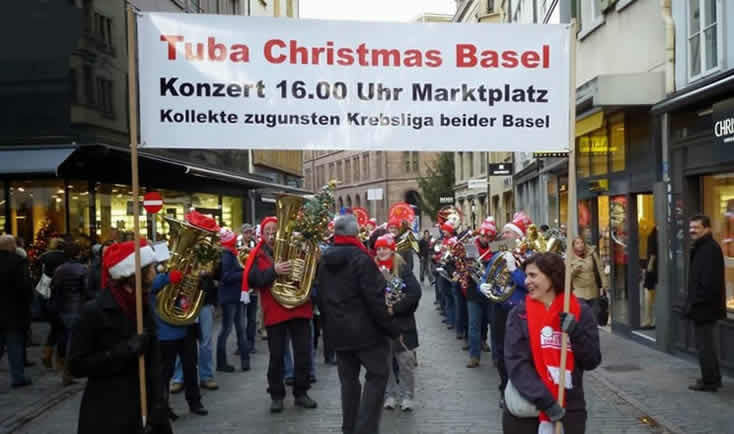 The traditional Tuba Christmas is exclusively for players of the „lower“ registers with Sousaphone, Tuba or Horn instruments and this year takes part for the 17th time in Basel.